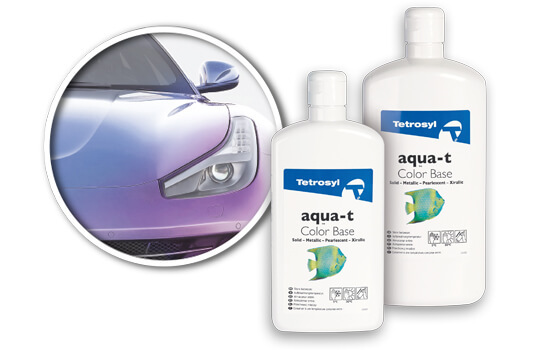 Tetrosyl has been working within the Refinish business for over 50 years, from the early days using solvents and cellulose, through to the modern day 2 pack acrylic and polyester. Using our vast amounts of experience and technical expertise in 2011 we developed an advanced waterborne paint system that meets the demands of the VRG market. Aqua-t waterborne colour system complies with all the latest VOC emissions legislations and provides bodyshops with an economic, high quality and simple solution to becoming compliant. Tetrosyl has invested large amounts to improve production facilities, advances in technology, innovative packaging and ease of application, all design to support the refinishing trade. Our Research and Development Centre have developed a comprehensive range which includes Variomorphic Compounds and a variosurface bodyfiller to name a few. Tetrosyl Refinishing provides a complete range for the modern bodyshop. Aqua-t solid colours are manufactured by employing the latest technology, which provides high chroma from pigments, maximises colour fastness and durability, and ensures a deep lustrous base coat. Aqua-T metallic provides precise colour matching to modern effect paint finishes through the design of their tiny bronze, silver and gold metallic platelets. Aqua-t pearlescents are specially designed to maximise the shimmering effect of light refraction. The full pearlescent effect comes shining through from un-refracted light, depending on the angle it strikes the surface. Aqua-t xirallics are the latest developments in extreme colour intensiveness. They include tiny aluminium flakes which enhance the brilliant colours with a sparkling glitter finish.